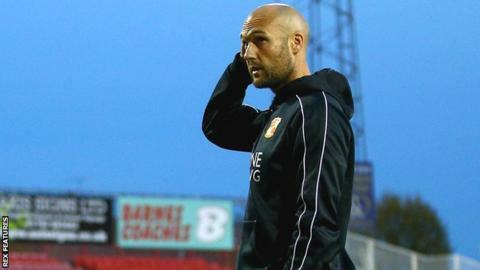 Swindon Town caretaker manager Luke Williams will remain in charge of the club until the end of the season. The 34-year-old has held the position since Martin Ling resigned on 29 December because of "the stresses of the job". The Robins, who are 14th in League One, have won both of their matches since Williams took charge. "I'm delighted to say that he has agreed to take the job until the end of the season," said chairman Lee Power. "We will then sit down and discuss the possibility of him taking the job on a longer-term basis." The former Brighton & Hove Albion Under-21 and reserve-team coach had previously been coy about his future with Swindon, telling BBC Wiltshire earlier this month: "My mindset was that I was the coach of the club and that was not going to change any time soon." The Robins travel to Sheffield United on Saturday, currently sitting seven points off the play-off places and eight points above the relegation zone.